Sandy Morris known to his musical friends as “the easternmost guitar player in North America” is an accomplished and multi-talented musician, producer, and engineer based in St. John’s, Newfoundland. Picking up his first guitar at the age of 15, Morris has made his living as a versatile and ingenious performer since 1965. 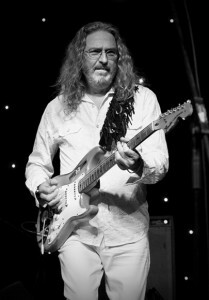 An original member of the legendary Wonderful Grand Band, his more recent collaborations include Rasa (with Erin Best), and the Eight Track Favourites. Sandy Morris has contributed his own compositions, his performances, and his musical expertise to film and television projects for more than 30 years. His credits include serving as musical director or producer for Land and Sea, Violet, Tommy, East Coast Music Awards, and Codco, among many other projects. In addition to his own projects and featured appearances, he continues to perform with numerous other musicians on their recordings and live performances.